Light is one of the fundamental components of life as we know it. Our planet revolves around the sun absorbing light which provides warmth, and the rays of light stimulate plant growth. The bottom of the food chain is filled with small organisms thriving on the energy derived from photosynthesis. The same sunlight that fuels growth in the simplest of organisms is one of the most important components of greenhouse growing; yet it’s one of the least understood. Anyone who grows in a greenhouse understands the result of magnifying the sun’s rays. Even so, it hardly seems to make sense that diffuse light provides the optimum light that plants need. Gardener’s often mistakenly think they need to maximize all of the available light for optimal growing conditions. Once you understand light diffusion, it’s much easier to understand what plants really need. Light diffusion is simply scattered light waves. A small intense beam of light breaks apart and disperses light waves across a wider area. Scattered light comes from many directions rather than one point of origin. If you’ve ever driven in dense fog you’ve experienced the powerful effects of diffused light. When the high beams are on, it is nearly impossible to determine the direction of the light source. The bright light seems to come from everywhere as the light scatters. Photographers understand the secrets of light diffusion and know how to utilize light to create the picture they desire. Cloudy days are ideal for outdoor photographers. Clouds diffuse the sun’s direct rays resulting in a softer light that does not create harsh shadows. Direct light conditions are ideal to create sharp graphical images and to highlight stark contrasts. If the direct light is too strong, many photographers use special lenses or other mechanisms to diffuse the light. Skilled photographers see the subtleties of light that most of us don’t notice in our daily lives. Twin-Wall Polycarbonate partially diffuses the light. Better than glass, but still tends to overheat. There are two basic types of natural light; direct and diffuse. Direct, or spectral light, consists of rays of light emanating from the sun. This directional and intense light creates shadows and burning rays. Diffuse light occurs naturally as the sun’s rays are scattered by the atmosphere, greenhouse gasses or cloud cover. Diffused light wraps around objects because it is not directional. The sun’s direct rays turn into diffused light as it passes through translucent material. The effect created will vary depending on the type of material the light passes through. Full spectrum, even light is the goal for a greenhouse. In most situations, lumens or foot candles measure light intensity. Light bulbs, grow lights, and natural light meters use these measures almost exclusively. These measures describe the wave lengths visible to humans. There is not a direct correlation between Lumens and the light used by plants because the human eye cannot see all light. PAR (Photosynthetic Available Radiation) light values measure the light used by plants for photosynthesis. Direct or diffuse light do not have different PAR values. This means that our eyes perceive differences in lumens between direct and diffuse light. Diffuse light appears dimmer to us even though total light transmission is not decreased. White light comprises all colors of the rainbow. Each color in the spectrum represents a specific wave length. Of the visible spectrum, violet wave lengths are the shortest while red are the longest. Ultraviolet rays are too short for the human eye to see while infrared rays are too long. The most visible rays to humans are those in the middle of the color chart, yellow and green. In contrast, light on the opposite ends of the spectrum, blue light and red light, are generally the most productive for plants. The light that generally produces the most efficient photosynthesis extends beyond the visible spectrum on both sides of the color chart. Plants cannot photosynthesize without the proper amount and type of light. A plant’s leaves act as solar collectors absorbing light energy. Photosynthesis occurs when light waves generate electrons. The electrons trigger the Chlorophyll in the plant’s leaves when combined with water to start a chemical reaction. Carbon dioxide atoms convert into starch, which produces energy for the plant, and Oxygen. Diffuse light increases plant energy production because the light bends around corners to reach the lower leaves, not just the upper canopy. With all the news about the “greenhouse effect” and greenhouse gasses in reference to global warming, it’s easy to see how too much of a good thing can tip the balance. Trapping warm air in our atmosphere is vital to our survival, yet when the thinning ozone layer lets in too much light (which also creates heat), the consequences are evident. Understanding and controlling the light is a part of creating a balanced microclimate in a greenhouse. Harnessing the heat and light energy in your own backyard greenhouse is easy to do, and beneficial. With a greenhouse you create a longer growing season, more productivity, and more outdoor enjoyment. To get the most from your investment, you need to think about light diffusion. 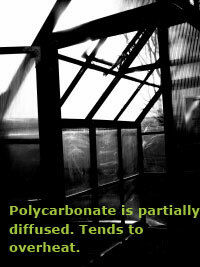 Without diffusion, directional light creates hot spots in a small area of the greenhouse, leaving the rest in shadows. Some plants will prosper in shade, however, most plants benefit from light on as many of their leaves as possible. 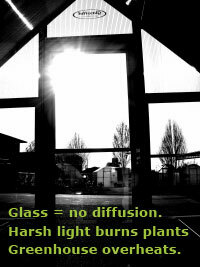 Direct light also creates excess heat that is trapped in the greenhouse. Diffuse light also creates heat but the heat is not as intense. Utilizing diffuse light is especially important if you plan to grow vertically on benches. In a greenhouse, using benches and hanging rods may double or even quadruple your growing area. Diffusing the direct light results in better growing conditions because diffuse light will reach all areas of the greenhouse and will not be blocked by the layers closest to the sun’s direct rays. The type of covering used on a greenhouse has the largest impact on light diffusion. Clear coverings such as glass, single-wall polycarbonate, and acrylic provide virtually no diffusion. Clear twin-wall materials such as polycarbonate provide some diffusion as direct sunlight scatters in a narrow band running perpendicular to the flutes. Materials having a milky white appearance such as polyethelene film, fiberglass, and Solexx Greenhouse Covering are examples of materials providing the best diffusion. Framing materials may account for as much as ten percent of greenhouse light quality. Thick or dark colored frames tend to absorb light creating shadows. The greenhouse interior should have as much white surface area as possible. White surfaces reflect rather than absorb the light bathing the entire structure in light. Ideally, the only dark colors in a greenhouse are containers. The dark color absorbs the entire light spectrum creating heat at the roots where it’s needed the most. If you already own a greenhouse and have a clear covering, you maybe able to improve your greenhouse light with a few simple tricks. A mixture of white latex paint and water will add some diffusion to a glass greenhouse, however, do not paint polycarbonate. 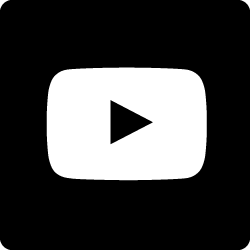 (Painting polycarbonate may interfere with the UV protective coating and may damage the panels.) If you have a polycarbonate greenhouse, you may be able to decrease shadows by spreading white gravel on the outside of your greenhouse along the base. The white color reflects light into your structure eliminating some of the shadows. In the warmer months, a shade cloth draped over the roof blocks some of the burning rays. There are a few simples tests you can do to evaluate light diffusion. If you visit the greenhouses in person, take a digital camera with you if you have one. Look at the greenhouse from various angles to see if there are bright spots and shadows. If you turn away from the direction of the sun do you see shadows or is the light reflected back toward you? Is the greenhouse drastically brighter in the direction of the sun or is the light fairly even? To get a better perspective, take a few pictures from inside the greenhouse. A camera will capture the light patterns that you may not see. Aim the camera in the direction of the sun with the goal of capturing as much of the greenhouse in the frame as you are able. The more the greenhouse you have in the picture, the better you’ll be able to evaluate the differences in the light intensity. Once you upload the pictures, convert the images to black and white. Removing the color highlights the contrasts so it’s easier to see the light patterns. You may also evaluate light diffusion from a sample of the material. If the sample is large enough, hold it up to a light source to evaluate the quality of light. The softer and larger the light is coming through, the more diffused the light. Another test that works well is a laser light test. You will need a piece of white paper, a laser light pen, and a darkish room or a box. Place the white paper on a level surface or on the bottom of the box. Hold the laser pen about one inch from the surface of the sample and the material about six inches above the white paper. The size and intensity of the red light demonstrates the diffusion. The softer and larger the light appears, the more diffuse the resulting light. Photographers spend years observing light and learning to manipulate it. They study shadows & colors. They learn how to offset the glare of a flash, how to soften the light around a child’s face, and how to capture the mood of the setting sun. You don’t need to study photography or light to successfully garden in your greenhouse. But once you understand that plants see light differently than we do, you’ll probably start to see things differently too. Most of all, you’ll know how to keep your plants happy! 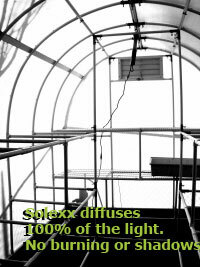 Solexx Greenhouse Covering - do it yourself (DIY) covering that is easy to work with and provides high insulation. Greenhouse Gardener’s Companion , Shane Smith.